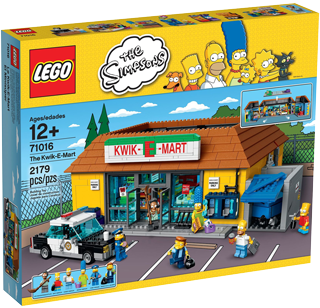 In what I should perhaps name the "Better Late Than Never" season here on New E, today we have the mammoth 71016 The Kwik-E-Mart . Bless Tim Goddard; he's found original things to say and taken some awesome pics! Who needs another Kwik-E-Mart review? I doooo! However there have been many already in magazines and online. The set has been out since late April so there has been plenty of time for those interested in buying the set to investigate and decide if they wanted it. So when Tim J asked me if I wanted to review the set I was not sure what extra I could offer to the discerning New Elementary reader. But it’s the Kwik-E-Mart so I had to say yes! You might recall that the Barnick brothers were systematically reviewing LEGO® Elves sets for us earlier this year. I'm horribly behind, but at long last here is Andrew Barnick's remaining review and yay it's a double-header. Today I’m going to be doing something a little different. Since many of the new parts and figures have already been discussed in previous reviews, I’ll be reviewing two Elves sets together. Don’t let that fool you, though—each set still offers a plethora of new or rare elements. First, I’ll look at 41071 Aira’s Creative Workshop. After that, I’ll dive into 41072 Naida’s Spa Secret! Doomed to spend all our Earth credits, that is. What's that, you don't like Doctor Who? Keep reading. You may well need this set anyway. 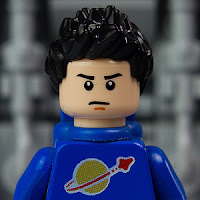 To say that I'm thrilled to have received LEGO® Ideas 21304 Doctor Who from the High Council of the Time Lords the CEE team would be an understatement. Doctor Who was my number one favourite geek thang from about the age of five until a few years ago when it got knocked off the top spot by LEGO. To have the two together at last is simply pant-wetting. Better yet, all bias aside, it's actually a fantastic set. I'll be reviewing it in the November issue of Bricks magazine, but don't worry I have plenty else to discuss here today! That's because this set is absolutely awash with excellent recolours and a couple of interesting new 2015 parts. Of course for the Whovians amongst us, it also contains printed elements that will just blow your tiny human minds. And zero stickers! I don't have the Doctor Who set yet, which is very distracting. I'm filling some of the time by writing this silly little post instead, because I do have the sonic screwdriver from the set! Two, to be precise. 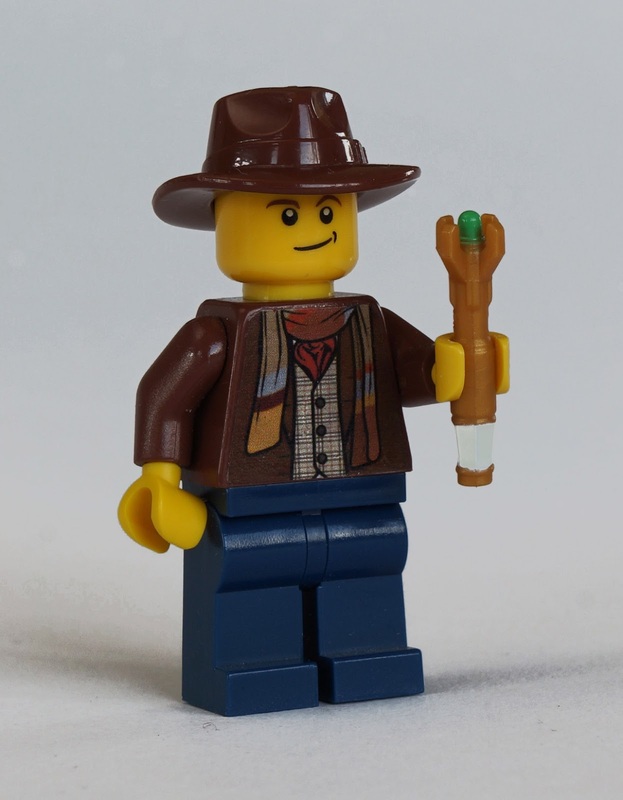 Here is one being held by the Fourth Doctor (a custom minifigure by minifigs.me). Yes I know his sonic didn't look exactly like that, but let's face it, neither did Tom Baker. I hasten to add, these did not come to me via the CEE team who will be sending out the review sets in due course. 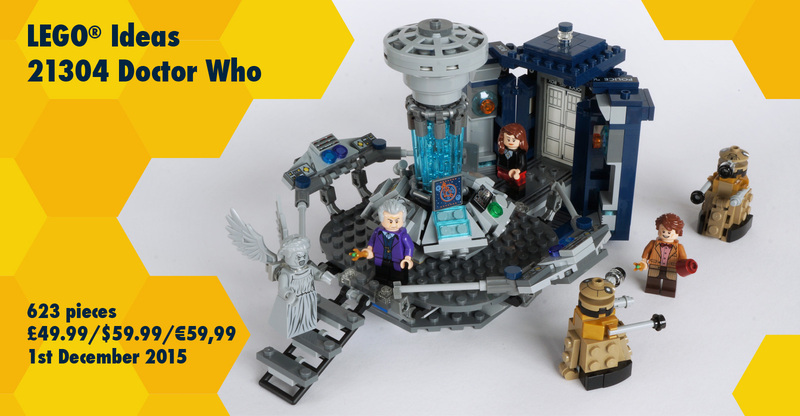 Mine fell off the back of the timey-wimey equivalent of a truck a few weeks ago and with the first review of LEGO® Ideas 21304 Doctor Who now live, I figured it was safe to let them out of the Pandorica. Sadly, LEGO® sets do sometimes languish on the shelves of New Elementary's busy, glamorous high-tech offices. It's not that I don't want to review them... quite the opposite. They sit there glaring at me, waiting for the moments when they catch my eye and accuse me of neglect. 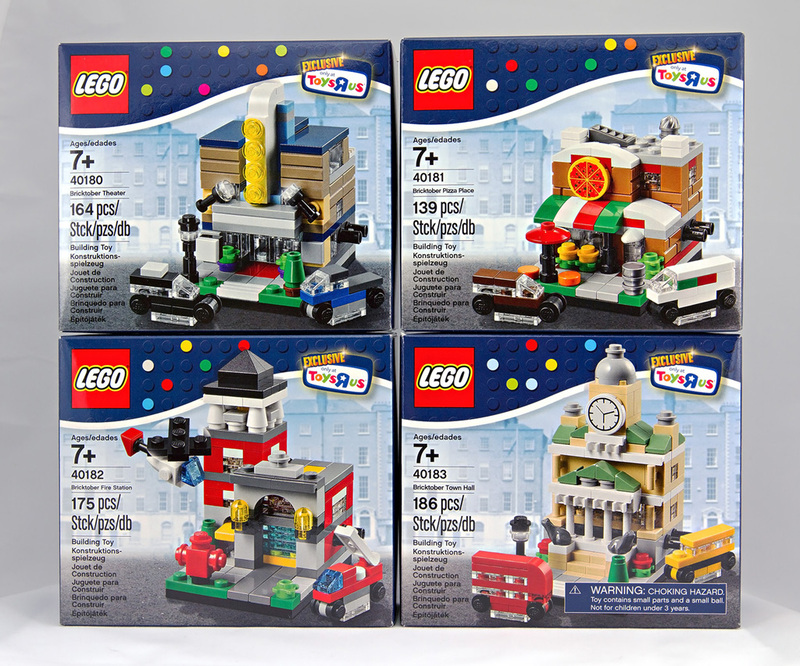 One such gaggle of sets was the 2014 'Bricktober' sets, kindly sent to me by the CEE team last December, which I was really looking forward to reviewing despite their lack of new elements. It never happened, which I readily blame on my new roles working on Bricks Culture and Bricks magazines. As October 2015 and its fresh range of 'Bricktober' sets inevitably neared I figured it was "now or never", and looked for a suitable victim to hand the poisoned chalice of a New E review about a bunch of old elements. The lovely, talented Ian Greig (bluemoose) fell happily into my trap, mwahahaa, and came up trumps by making you all some LDD files of the sets. While he was working on the Bricks Culture magazine article about the LEGO Space: Building the Future book, which I did a lot of the photography for, our good host here at New Elementary, Tim, arranged a photography session in London on a quiet Sunday morning. As with any ‘modelling’ assignment, there’s a lot standing around & waiting while lights are moved, people positioned, camera angles investigated, lights moved, people repositioned, and so on… which, delightfully, meant there was lots of time for catching up with friends, talking about future plans & generally chatting about stuff. I can’t remember how we got on to the topic, but we were talking about recent LEGO sets we’d missed buying that we’d really like to get hold of. 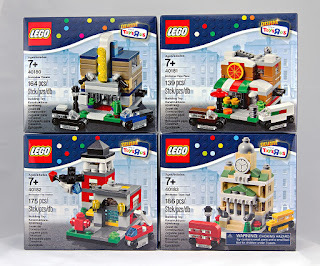 I mentioned that I quite fancied getting hold of last year’s Toys’R’Us ‘Bricktober’ micro-modular sets; I’d seen them a few weeks earlier at a BBQ at Huw ‘Brickset’ Millington’s house, and, yes, they were fairly small & simple, but I did really quite like them. Tim turned to me and said “OK, I’ll send you the Bricktober sets & you can write a blog post for New Elementary about them”. “Sure,” I said, “no worries”.